IS CNN lying? How could we pinpoint the "average" demonstrator in Ferguson, MO? 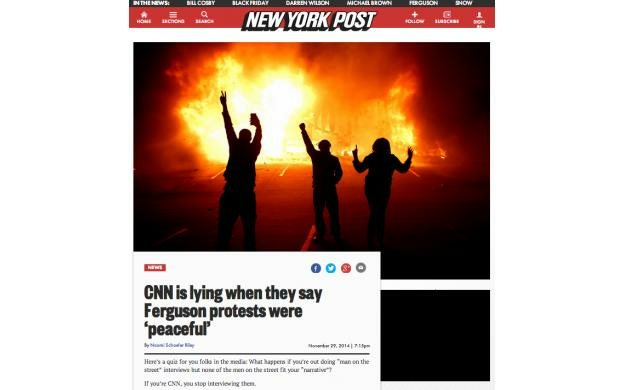 How would you know if CNN was lying or misrepresenting the actual events in Ferguson? LinkThe original article about CNN allegedly choosing to ignore the actual demonstrators because they didn't fit their narrative of "peaceful protestors"
What data might you want to know about Ferguson and the surrounding municipalities? What types of bias would we want to be careful to avoid in getting a representative sample of Ferguson demonstrators/protestors? I don't know if there is "an answer" to this, but I'm going to use it to discuss experiment design and simulation in my AP Stats class. I grew up going to church in Ferguson and I teach in the district that serves the city (and several surrounding), so I've experienced lots of questions from friends out of town about the REAL story of the Ferguson protests and their violence/lack of violence. I'm sure that how their town is represented is also on my students' minds. LinkAnnexation Survey Report from May 2014 - citizens within Ferguson and an area they were considering annexing were asked to rate their opinion on government services. Ratings start on page 10. Sample methodology on page 13. Is this about Ferguson or CNN? What did they use to determine this. How do we measure 'peace'? If the caption was removed, could this be nothing more than a shot from skillfully crafted music video? Are they running forward or away from the fire?